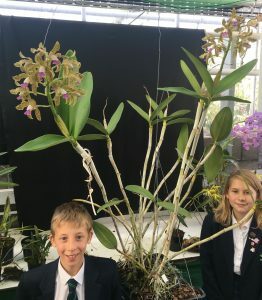 In contrast to yesterday’s miniature pleurothallis we have our largest cattleya species today and it dwarfs Gil and Issy. It comes into flower in autumn and the blooms last 8 weeks. 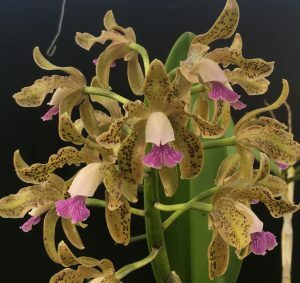 This species of Cattleya has longer bulbs than any of the other Cattleya’s that we have as the bulbs are over a meter long and the flowers extend by another 50cm. With two flower spikes each with twelve flowers this year, it makes a stately plant. This is the coerulea variety which has a more blue /purple lip and lighter petals than most clones but this photograph taken today makes the lip look a more normal pink colour. We grow this orchid in our Warm Americas section with a minimum of 15 degrees C.